NFL week 6 is loaded with great games, Cowboys vs. Packers, Patriots vs. Bengals, Falcons vs. Seahawks and of course Denver Broncos and the San Diego Chargers that will face off on Thursday, October 13 in what should be one of the best games this week. Many options to bet on NFL this week and here at AceSportsbook.com we bring you like every week our insight on some of these games and free picks. The Broncos had a rough loss last week when they fell at home 23-16 against the Falcons, their first loss this season (4-1), the main problem for Denver was the shoulder injury suffered by Trevor Siemian back in week 4 which has forced unexperienced quarterback Paxton Lynch to fill in for him, unfortunately Lynch still has a long way to go before being able to earn a starter position; however, and luckily for Denver, it seems that Siemian will be back to the field this week to face the Chargers. Broncos have a strong defense, averaging 17.4 points and 301.0 yards per game, while offensively they are doing 25.4 points and 327.5 total yards. Denver’s head coach Gary Kubiak had to be taken to the hospital after the game because of severe migraine, he is being released on Monday afternoon but there’s still no confirmation on whether or not he will be working this week with the Broncos. Chargers are also coming from a loss; well, in reality they have been mostly loosing this season (1-4), they fell to the Raiders 34-31, in reality it wasn’t necessarily that the Raiders are a better team than the Chargers, but they did know how to capitalize on the Chargers’ mistakes, the majority of which come from their defense; actually all the problems Chargers have had so far into the season come from their defense which has allowed 28.4 points per game and 291.6 passing yards. Their offense hasn’t been bad, with an average of 30.4 points and 373.2 total yards. 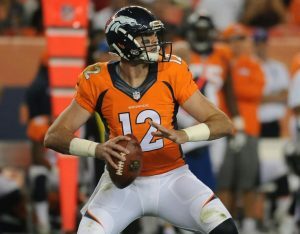 Denver is the favorite to win at -2.5 the over/under sits at 44.5 ; the Chargers may be playing at home, but with Siemian back and unless Chargers work a miracle with that defense I don’t expect Broncos to have any problem beating them and covering the spread, yet I wouldn’t take anything more than -3. My bet: Broncos -2.5 and the under. If you can’t get -2.5 or -3 then go for the money line. Ace Sportsbook is waiting to take your action, bet on NFL, NCAA Football or any other sporting event of your liking; great lines, the best customer service, friendly website where you can place your bets 24/7, live betting on NFL and all major match ups. Make your bets and get that extra cash you need for the end of the year expenses.